Whether you prefer classic, modern or rustic bar stool for your kitchen, Furniture Chelsea is your one-stop as we offer you a great selection of bar stools in a wide range of styles. From modern to industrial, glam to vintage, no matter what your style preference, we stock the perfect piece to suit your space. Our bar stools are functional, stylish and trendy. Whether you need a functional, swivel stool, a classic chair-style seat or a versatile piece for your breakfast bar, we have endless choices to fit your specific taste. Bar stools are increasingly becoming more popular in our homes for everything from socializing at night to a peaceful breakfast in the morning. These bar stools come with or without armrests, padding, and upholstery, as well as we have backless and high-back bar stools. We also have bar stools in different materials like acrylic, metal, rattan, wood, etc. 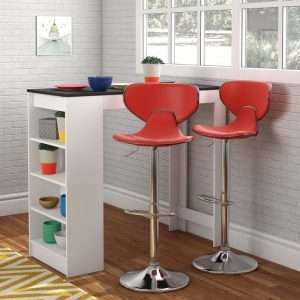 Our bar stools not only add functionality to your room but also enhance your overall decor theme.